Could it be the discipline inspired by his Mormon faith? Residents of Utah, according to Chronicle of Philanthropy give away as much as 15% of their discretionary income each year. Jon Huntsman is the founder of Huntsman Chemical Corporation, the largest manufacturer of polystyrene in the U.S. In case you’re wondering what they produce two examples can be found in McDonald’s clamshell burger container and L’eggs pantyhose egg shells. As early as 1962, Huntsman told his wife that he “wanted to start his own business so he could make a difference” for people with cancer. Sharing was something his father and mother taught their family to do, yet these lessons were perhaps not as powerful as the lesson Huntsman learned his senior year in high school. Jon and his brother dreamed of attending a university upon graduation. He held two jobs to help pay the families medical expenses. With nine children in the family there wasn’t going to be any financial support provided by his father and mother. He was a good student and student body president his senior year. Harold Zellerbach was head of the nation’s second largest paper company. Along with his son, Raymond Zellerbach, they came to Huntsman's school in Palo Alto, CA seeking a western state high school senior to be the recipient of the Zellerbach family scholarship to attend Wharton School of Business. Huntsman had never heard of Wharton. Yet based on his high school performance he received the Wharton scholarship. He thanked both father and son, but said the grant would not be sufficient to permit him to attend. Huntsman realized he would have to work fulltime to make it financially, and didn’t believe he could succeed at an Ivy League school burdened with full-time employment. His benefactors worked out further arrangements to provide all his tuition, fees, plus room and board would be covered! Financially he knew there was no where he could ever pay the Zellerbach’s back. They wouldn’t let him even if he had been able. Instead they simply said, pass it on! And has he! In addition to the financial scholarship he provides for the families that work in his company an example in the book offers evidence how he’s passed on the scholarship award the Zellerbach’s provide for him. Scheduled to speak at a commencement, his turn to speak arrived nearly an hour and a half into the ceremony. As he sat on stage waiting he began to whittle his prepared address. By the time he approached the dais he had it down to a single sentence. Then he did something impromptu. Turning to the president he announced he would provide the university with 200 scholarships at $5000 each. The experience at Wharton College launched his career. He’s paid that back many times through his generosity. How many people do you know take out bank loans to meet their philanthropic pledges? If he makes commitments to help others, there ought to be no retreat from those obligations because the company’s finances are not temporarily robust as anticipated. You might believe it's effortless for a multibillionaire , yet Huntsman giving started before he was rich, beginning in his career in the navy earning just $320 a month. It continued through two challenging periods with his company when he was urged to file bankruptcy. 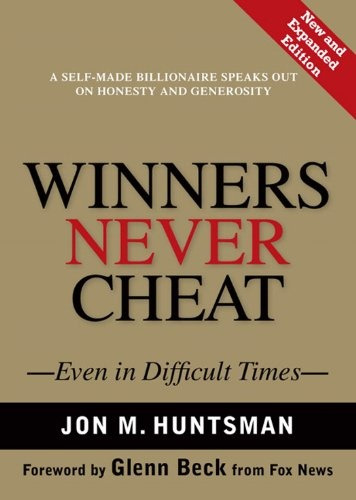 Winners Never Cheat is mentioned in the book Give and Take several times, citing Jon Huntsman as an example of how a business man conducts himself negotiating and dealing with others along with the focus of conscious giving. The book is full of poignant quotes that drive home the message of the book. It’s worth the price just for this alone, if you enjoy quotes as much as I do. While I was curious to discover how this multi-billionaire succeeded while unselfishly giving so much I wasn’t prepared to discover that he shared a similarity with me in regards to his health. He lost his mother and father to cancer, and has survived three bouts with cancer himself. Wikipedia notes that Huntsman’s giving exceeds $1.2 billion annually. The main reason he decided to take the company public in 2005 was to help fund his charitable giving, and particularly to focus on areas of cancers research. Finally a thank you to Gary Gunn, one of my mentors and business coaches who shares his accountabilities with me almost every week. He’s a former E-Myth Coach who sent me the book Winners Never Cheat by Jon Huntsman after we’d discussed the book Give and Take. Normally on vacation I read a lot, often catching up with the many books and titles Verne and our Gazelle Coaches Growth Summit suggest as excellent for best practices. Having not taken a full week’s vacation in almost two years I took a little more time to relax and unwind. If you’ve not taken a vacation in a while I’d suggest reading Vacations - Breakthrough in Time Management, Less is More: Sleep is for Failures and the 90% Rule and picking up the book The Power of Full Engagement to appreciate the value of rest and recovery. Where does confidence come from? That’s next blog.